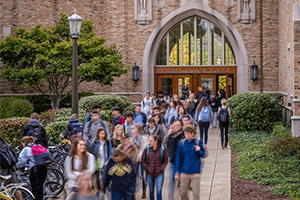 Each year Notre Dame boasts a freshman class that is the “most diverse, unique, talented, and brightest” 2,050 students. This year the university even set a new record in African-American enrollment with a whopping 147 students identifying African-American (when reporting their single or multiple race or ethnicity), 13 percent Hispanic, nine percent African American, 11 percent Asian, and one percent Native American. Yes, that is one WHOLE percent for Native Americans. Additionally, 24% admitted to owning a gerbil or fish, 1.6% of people have read a book from another country, and a record breaking 39% demonstrated an interest in white male choral groups. The university has really shaped its class with all sorts of colors. Just take a look at this year’s freshman class picture, with the most diverse group of students ever captured on film. Blue, yellow, white, green, red — every color of the rainbow was visible and widely present in the current freshman class. But Notre Dame wants to do more with diversity than merely meet statistical quotas. The campus takes it upon itself to expose students to more ethnic foods as well. Taco Bell is no longer the only restaurant serving authentic tacos. NDH makes sure that every day (except Fridays during Lent) they have a taco option for students. Legends even sells nachos! Subway recently introduced a “meatless Mexican sandwich,” while Smashburger and ABP have decidedly added ¡Fiesta! seasoning to all their specialties. Another ethnic food includes “Korean crepes,” a specialty found only in Notre Dame, IN (not even in Korea! How foreign!). The class Facebook pages are another meaningful way for students to connect. Chad Brown, for example, asked his classmates if anyone wanted to split an Uber from O’Hare on the way home for Easter. Fostering this culture of openness and acceptance is exactly what the university needs. The University of Notre Dame is an institution of the utmost academic standing, and prides itself on being a force for good in the community. The diversity at Notre Dame contributes to its effectiveness as an establishment and is not an issue that needs to nor should be re-examined. After all, like the murals in the Dome, Notre Dame does not need to be adapted to modern society. Want to congratulate ND admissions? Call them at #: 574-631-7505 or send ’em an email: admissions@nd.edu!